Best Jamaican Jerk Chicken Recipe - Mouth Watering! We inherited the "jerk" method from the Arawaks, the earliest recorded inhabitants of Jamaica. They found their food through farming, hunting and fishing. To preserve their meat they used a storage method called "jerking". Here they dug a hole in the ground, place stones on the bottom, place their meat on top and poke holes in the meat. After this, they would insert a mixture of herbs and spices in the holes. Then, when desired, they would cut portions of the meat and cook on an open fire -this gave the meat the "smoked" flavour. We may not have kept the preservation method, but certainly kept the approach to seasoning and cooking, and this has been passed down and inculcated as a part of our unique culture from generation to generation. Today, we jerk a wide array of meats including chicken, pork, lobster, conch and fish. 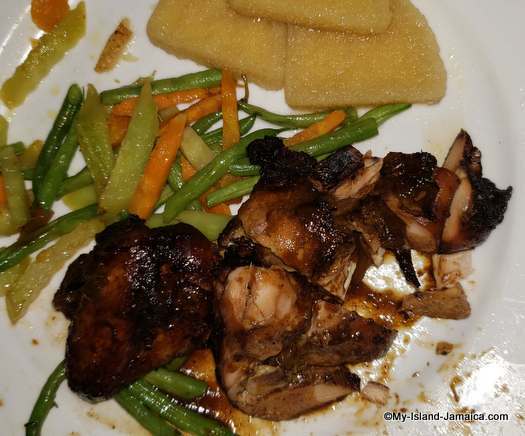 The Jamaican Jerk Chicken is special though, it’s a delectable way of cooking chicken that melts in your mouth and tantalizes the taste buds making you want more and more. Of course, the secret is…. actually no secret at all, the ingredients. Here is a simple recipe. Go ahead, give it a try! In a bowl, combine allspice, thyme, cayenne pepper, black pepper, sage, salt, garlic and sugar. Mix all these herbs and spices together well. Then, add cooking oil, soy sauce and vinegar. Mix all these together. Add scotch bonnet pepper and onion. Add chicken pieces ensuring all pieces are covered with the mixture. Let sit for at least an hour for it to marinate. After marinating, place on grill and cook until chicken is done. Turn and baste each side with the jerk sauce. Serve with rice & peas and vegetables, festival- or anything you like! Results are best if cooked on a grill but it can also be baked in an oven. If you have any sauce left over, don’t worry because it can be used as dipping sauce on the side. Believe me; you really haven’t had Jerk, until you’ve had our Jamaican Jerk Chicken! Ready To Cook Authentic Jamaican? Click Here to see the full list of our easy and exciting Jamaican recipes, completely free! Make sure you subscribe to my free monthly e-zine My Island Jamaica Digest (MIJD) and stay with the latest from Jamaica! The Windrush Generation - What Does It Mean? What's The Scandal About? What exactly is the windrush generation? What does it mean? And what is all the fuss about? We answered but also disected it to provide a clearer understanding.